The frame we've chosen is rectangular, enabling us to place 3 identical squares along its length. The canvas is linen but will be completely covered over (including the sides, of course). A small square frame is stuck to the uppermost square, to create a diamond shape. 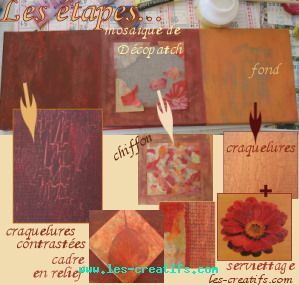 crackle-effect painting: by applying a coat of paint, then a crackle medium, and finally a second coat of paint in a contrasting color (always painting in the same direction), the paint will crack as it dries. By applying a thicker coat of crackle medium, a more 3D, raised effect is created. thickened paint: by adding a heavy gel to acrylic paint (up to 50% of the volume of the paint), you can create and work with a very thick paint. paper napkin applique technique: a paper napkin pattern is carefully cut out then glued on using glossy glue/varnish. The dark orange flower and its distinct shadow stand out well against the orange-colored background. torn paper mosaic: the Decopatch paper is torn up and glued on to create a central square. glueing on 3D objects: objects to be painted or decorated may be glued directly onto the frame to create a 3D design. You may also create these 3D effects yourself using texture effect or modeling paste that you can stick on and then paint. We've glued on a small frame here. 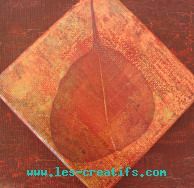 It was painted beforehand in similar shades to the rest of the design, albeit a little lighter and more golden in color, then a decorative leaf was glued on using glue/varnish.